The Bubali Bird Sanctuary consists of giant wetlands on the west coast of Aruba and is an important place for all kinds of migratory birds to come to rest and breed. The Aruba Bird Sanctuary does not have specific opening hours, but it’s best to go early morning at dawn or late afternoon at dusk. During the hottest hours of the day – from 12 PM to 4 PM – the birds will not be very active, and because of this, it is recommended to plan your visit well. 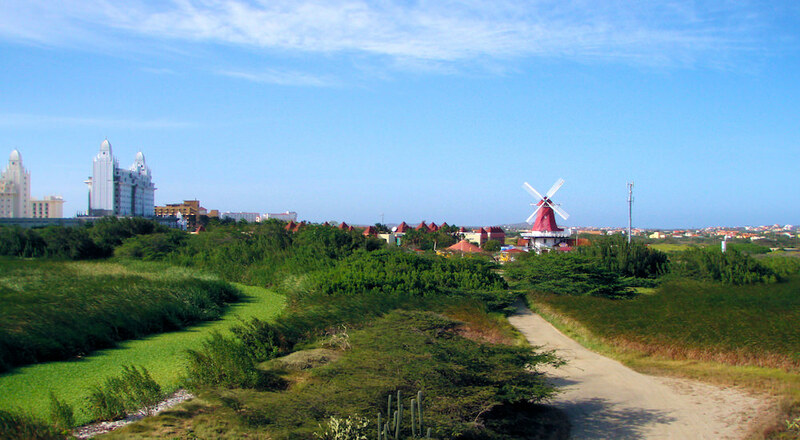 The Bubali Bird Sanctuary is located on the west coast of Aruba, very close to the high-rise hotels and near the Aruba Butterfly Farm. To reach the Bubali Bird Sanctuary from Oranjestad, follow the L.G. Smith Boulevard heading west. Next, head north for about 2.2 miles. At the intersection, turn west (left) towards the beach on the nameless road for about a quarter mile until you find an entrance to another dirt road on your right hand. This dirt road will take you along the mangroves on the sanctuary’s west side. Here you can park your car, and continue on foot. Depending on what time you visit the bird sanctuary, you will likely spot multiple bird species. Black-necked stilts: a wading bird with black and white feathers and long red legs. Bahamian pintails: a duck with a pointed tail. Lapwings: a large plover, with a black-and-white head and a distinctive call. Troupials: a songbird with orange and black feathers and yellow eyes. Caribbean parakeets: a small parrot with mainly green feathers and a long tail. Moorhens: a rail with predominantly blackish feathers. Coots: an aquatic bird with black feathers and a horny shield on its forehead. Green herons: a large fish-eating bird with long legs and a long S-shaped neck. Egrets: a heron with mainly white feathers that extend into plumes during breeding season.